HABERMANN -Prospect von Boston gegen der Bucht am Hafen. / Vue de Boston vers le Cale du Port. HABERMANN, F. - Prospect von Boston gegen der Bucht am Hafen. / Vue de Boston vers le Cale du Port. Prospect von Boston gegen der Bucht am Hafen. / Vue de Boston vers le Cale du Port. - HABERMANN, F.
Title : Prospect von Boston gegen der Bucht am Hafen. / Vue de Boston vers le Cale du Port..
Map maker : HABERMANN, F.. Size : 10.0 x 15.6 inches. / 25.5 x 39.6 cm. 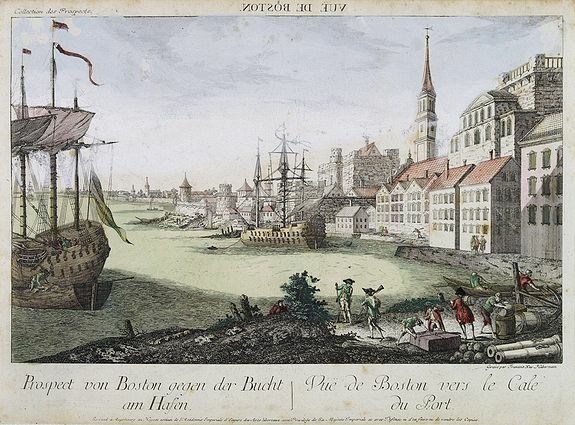 Description :A so-called optical print of a fanciful view of Boston harbour, two ships at anchor, British soldiers and men working, and merchandise on shore; an idealized view depicting Boston as a typical European city. In the eighteenth and nineteenth centuries there were many popular speciality establishments in Paris, Augsburg and London which produced optical viewing devices and special engravings to be viewed through them. In the 18th century, a type of "perspective" print came into existence, whose exaggerated converging lines were intended to produce the optical illusion of deep recession without the benefit of lenses and mirrors. The viewing devices for which these perspective prints were produced consisted of a simple box or frame with a peephole. Later, people peered through lenses, and finally a mirror was incorporated that required the use of reversed or mirror-image pictures. The American Revolution in drawings and prints; a checklist of 1765-1790 graphics in the Library of Congress. Condition : So-called optical print. Paper slightly age-toned as usual.